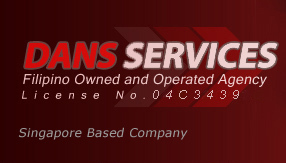 DANS SERVICES is a Filipino owned and operated FILIPINO EMPLOYMENT AGENCY, incorporated in Singapore since 2004. We specialized in recruitment and deployment of FILIPINO Maids for Singapore employment. Care Givers - Filipino Trained caregivers / Nurses and Midwifery Graduate to work as Care givers in Singapore Nursing Homes. Skilled Worker - Filipino specialized Skills to Work in Singapore Company fo their specialize skills under S-Pass or Employment Pass work Visa. Filipino Professionals - Filipino Engineers / Architects / Accountants / Artist / Commerce Graduates ..... to work in Singapore Company under S-pass or Employment Pass Visa Category. FOR OTHER DESTINATIONS / COUNTRY - We basically take care of recruitment / selection / Qualification Check and processing and documentations from the country of origin ( Philippines or Singapore ) for the required working visa application to the country of destinations. VHI ANN SAPUCOL VALDEZ . WEGGIE CLAIRE ESPERANZA VIERNES . MARY GRACE PATAO PATUBO . APRIL JOY SANTOS TABAGO .